Karen Karnes’s Winged Vessel is from one of the several series of woodfired work made in her Morgan, Vermont studio during the late 1980s and early 1990s. During this period, her work was larger in scale, more sculptural, and was shown in solo exhibitions in New York art galleries (though she continued to make her signature flameproof casseroles). 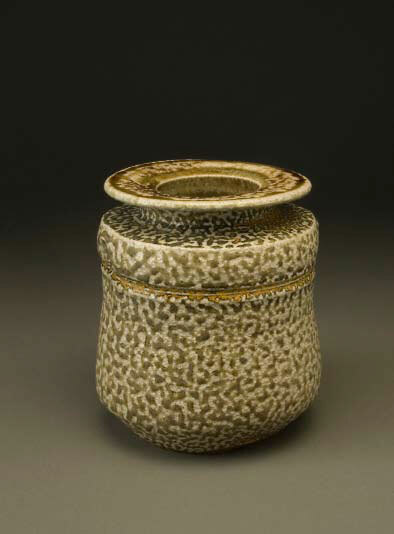 A sprayed copper matte glaze gives a quiet greenish patina to this vessel’s surface, modulated by fly ash, which imparts a golden haze to the surfaces facing the fire. The body is coil-built on top of a thrown and manipulated base, allowing for a gentle asymmetry. The wings and top with its in-folded opening are thrown and attached. In this piece, Karnes combines several themes she was exploring in this period: scale, the slitting of hollow forms, cratered openings, and horizontal attachments or wings. The form springs off the ground in much the same way as her small vase in this collection, from a narrower foot that stretches out into a generous foundation that is the base of the vessel’s drama. The strong edge at this widening gives almost a sense of horizon, of a suspended land mass. While there a pot below (and one might argue that the whole form is suggestive of a teapot, with a body, spout, handle and opening), what happens above is quite a different geography. The sculpted base line is echoed by a second horizontal line drawn onto the surface that encircles the form, connecting its extended limbs, and slicing through one of them to reveal (and displace) the tapered hollow wings. The wings stretch the form horizontally and also suggest a front and back, (as do the round dimples of the small vase). A vertical line bisects the horizontal one and slices open the mouth of the vessel. An opening opening up. This piece embodies such conceptual play as it wrestles with many polarities: vessel and sculpture, body and landscape, mass and buoyancy, solidity and hollowness, line and incision. Works from this period of Karnes’s career broadened the context for ceramics, expanding the formal and conceptual issues a potter might explore, moving into territory all her own. Karnes made this small salt-glazed vase during one of her longest and most productive creative periods, the 25 years when she lived in the artist community of Gatehill in Stony Point, New York, selling her pots out of her studio and a few New York venues. She discovered salt-glazing during a workshop she taught in the late1960s at the Penland School in North Carolina. This technique proved very fruitful for Karnes who used several clay bodies and slips, for different effects. This example is of a kaolin-based body to which silica sand has been added to attract the sodium introduced into kiln. The whitish body is visible in between the droplets of pale gray/green salt glaze. The resulting orange-peel or pebbled surface is especially glassy as this pot was fired near the fire-box. The unusual yellow band of color is the result of an application of uranium oxide—which Karnes used for a brief period in the 1970s—in the groove just below the shoulder, linking it tonally with the amber interior glaze. Like many of Karnes forms, this one has a generously undercut wide base that supports a slightly narrowing body, in this case, a subtly concave cylinder. The shoulder is almost horizontal; the neck short; the rim again nearly horizontal and almost as wide as the pot. A pool of glass accents the rim. The harder line of the shoulder is offset by two round depressions on opposite sides above the horizontal accent line, affirming the plasticity of the thrown clay and creating an axial relationship to the viewer. The pot and the beholder, eye to eye. Karnes’s work from this period seems to synthesize the European design influence that she internalized as a student of the architect Serge Chermayeff at Brooklyn College in the 1940s and the Mingei principles she took in during Soji Hamada’s two-week visit to Black Mountain College, where she as a resident potter in the early 1950s. The vase feels modernist in its proportions, yet evokes Japanese aesthetics in its natural material and sense of spontaneity and process.